You don’t have to quit your job and leave the country to experience new and interesting things. Or to delve into a new and different “culture.” You just have to look in your own backyard. Or maybe a neighbour’s backyard, as we recently discovered. In July 2010, we attended the Dawson City Music Festival and came home with about 16 CDs from artists we had never heard of before but fell in love with. One of these artists was Pat LePoidevin – a young Canadian musician who performed magic with his voice, a ukulele, a guitar, and a loop pedal. We have been listening to his CDs ever since and were stoked to find on his MySpace page that he was playing a house concert in Regina. A house concert? we wondered. Like in an actual house? Is that really a thing? After emailing Pat, who directed us to Erin (who owns said house), we found out that yes, house concerts are an actual thing. This particular one would cost $10 a person and they would be having a potluck beforehand for anyone that wanted to partake. I naively asked if I needed to buy tickets in advance, or would I be sure to get one at the door? (I still hadn’t figured out the whole house concert thing yet). So there we were at 5:00 on Easter Monday, standing in front of a strange house holding a dessert, not sure what to expect from the evening. We were the first guests to arrive and we were instantly made to feel at home and offered a glass of wine. 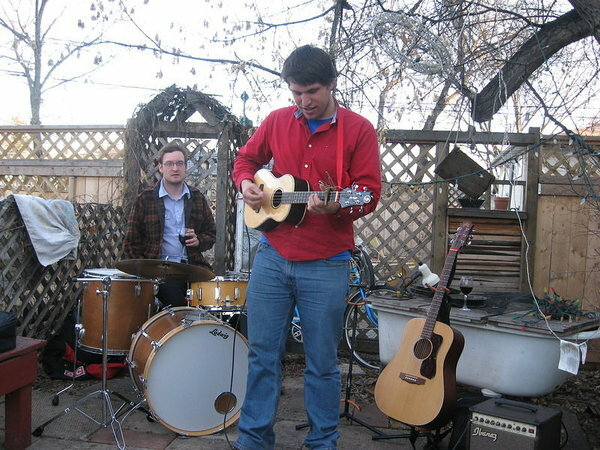 We sat on one of the benches in the varied array of seating set up outside in the backyard, and before long Pat LePoidevin and Matt Sarty (the musicians) came out to join us. We sat and talked for a while as more and more guests started to arrive. This is when we realized how great this evening was going to be. How often do you get to hang out and chat with the musicians before a show? Eventually, a delicious meal of roast lamb, potatoes, and various salads was served. After dinner, Pat and Matt set up their gear in the backyard. It was such a beautiful evening everyone decided it would be best to hold the concert outside. Matt set up a drum set and Pat played guitar and ukulele with the loop pedal, using a little amp. He kept the amp turned down fairly low, so he could sing over the music. 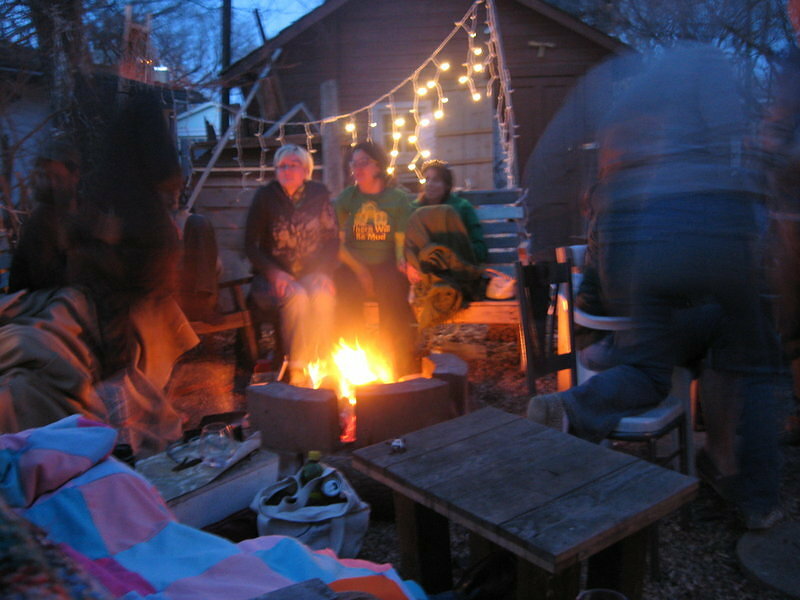 The concert was magical… a fire was lit, blankets were brought out to keep us warm, and the music was fantastic. Pat’s set list was mostly from his new CD, Highway Houses, but he played several of our favourites from his other albums. The atmosphere was very low key due to the intimate setting and there was a lot of storytelling and audience interaction. One of the highlights of the evening was the final song… the title track from “Highway Houses.” Pat put down his guitar and ukulele and plugged a microphone into the loop pedal. After commenting on how much he hates holding a microphone, he started into the song. With his powerful voice and the aid of the loop pedal, he repeated the few verses of the song again and again, harmonizing with his own voice on each loop. It was a perfect end to a wonderful evening of music. I hope to have many more interesting evenings of great conversations and music with new friends on our upcoming RTW journey. The Pat LePoidevin house concert was a reminder that you don’t have to cross country borders to experience something new and unique. If you have never heard of Pat LePoidevin, he’s definitely worth checking out. His songs are built up carefully layer by layer, in such a way that you’re instantly drawn in. His passionate, poetic lyrics and sheer musicality draw you into an ethereal world for as long as you listen. You can access his music on his MySpace page or check out the videos below. Pat LePoidevin’s “Moonwolf Departure” – Love this song! It shows some of what he can do with a loop pedal. Wow! That’s really cool. I think I would have been a bit nervous/intimidated to turn up at someone’s house but it’s such a cool idea. And thanks for introducing me to some new music – he has an awesome voice.